Inspiration, Intuition and the whispers of Angels. At the time, I didn’t realize that the bluebird, itself, had any particular meaning. I suppose I thought it could have been any bird but this one was the easiest for them to show me. As time went on, I kept seeing this bluebird. During Christmas, I came across a bluebird ornament that I sent off to Jackie as a Christmas gift. I’ve come to realize that this bird represents ME. ” Wow, really?” I thought. Oh yes, and if I had any doubt, as usual, they made sure to keep me on my toes with many outward signs that I could not ignore. I looked up the meaning of the bluebird and found that it had the overall symbolism of happiness. This surprised me. I thought there might be something more mystical afoot. When I did more research I realized that birds, in general, have been considered messengers throughout history. In the Bible, it was a dove carrying a branch in its beak that let Noah know there was land nearby. The dove has often been used as a symbol of the Holy Spirit, as well. I felt that for me, this was my version of a dove. It gave me confidence knowing that I had chosen to call myself the correct thing- a messenger. I had struggled with doing business cards for months, worrying that ‘psychic’ would make me sound spacy or ‘medium’ might narrow the expectations of a session to only speaking to loved ones that have crossed over. The bluebird is a messenger of happiness, and feels more comfortable to me in terms of how I see myself. In January, I began writing this blog, and suddenly there was a new energy around me that I can only describe as an angelic vibration. Once again, I am my own biggest critic, and I wondered if I was correct in receiving the name of this loving, gentle spirit that had come to inspire me with my writing. “Too cliché,” I thought, “I can’t be getting this right.” But time after time I was lead to a website that depicted various stone angels from all over the world. I kept coming back to it and I was drawn to one particular angel. Under the picture it said, “Angel of Grace.” Still, I put it aside and went along with my everyday life. Then one day, I was in a gift shop. I allowed myself to be drawn to the place in the store that seemed to be sparkling with energy. As I looked up to see the piece of art on the wall, my eyes popped and my jaw dropped. I smiled a knowing smile and mentally told my angel that, yes, I get it now. The inspirational artwork, by Kelly Rae Roberts depicted a sweet-faced girl with dark hair, and a butterfly resting on her cheek (the butterfly is also one of my symbols that guides me when I’m unsure of the direction I’m going in). In little letters along the collar of the girl it said, “listening to grace.” She now resides on the wall just above my monitor, so I can look up at her and remember, not only that she is helping to inspire my writings, but she patiently continued to give me signs of her presence until I finally got it! The name of my first book has dual meaning. The “Listening to Grace” part of it is not only a message to the reader that they can learn to listen to Spirit, but also in honor of my beautiful writing angel, Grace, and how I,too, learned how to pay attention and listen to my own guidance through signs and symbols. 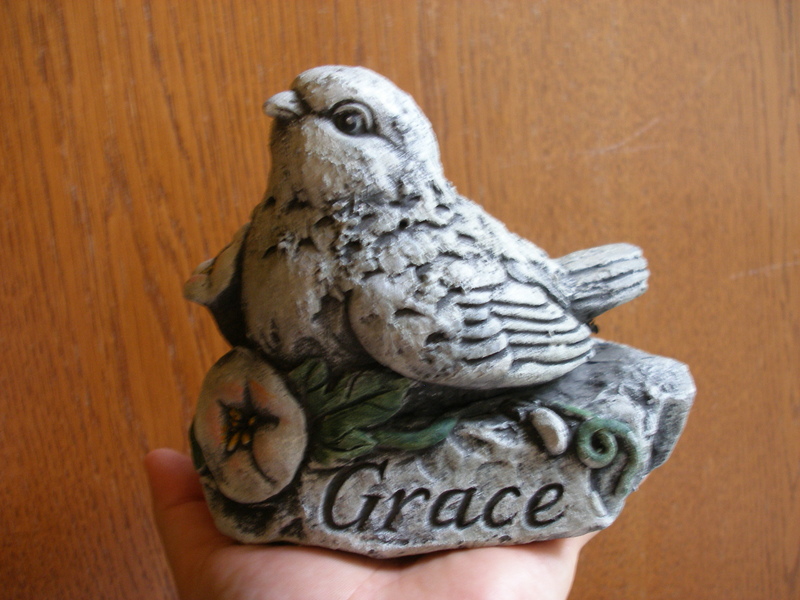 If that weren’t enough, I received further confirmation through a gift from a friend in the form of a garden ornament with a little bluebird, a morning-glory (one of my favorite flowers, and also looks like a horn that heralds good news) and the word, “Grace,” carved along the side. As I continue on this path, I am grateful to all of the loving souls who are pushing me to do more and to be better with each challenge I am faced with. It is a gift to be able to live my life knowing that I am not alone– even if I occasionally play the role of the skeptic! ~ by healingstarspirit on April 19, 2010.
another great writing that I got the chance to read just at the exact right time! thanks for being you and being there!!! And: yes!! I want a signed copy of your book too!!!! !